to act more violently against pro-democracy activists. 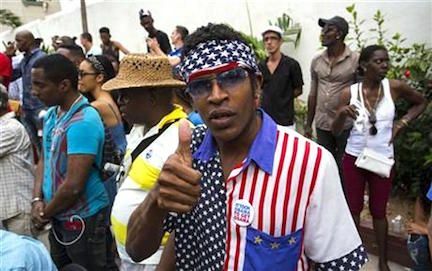 Hours before President Barack Obama landed in Havana to meet with high-ranking members of the islandâ€™s repressive communist regime, more than 50 pro-democracy dissidents were beaten and arrested, shoved into buses to be shipped into the nationâ€™s jails to prevent them from disturbing official activities. At least 50 of those arrested are members of the Ladies in White, a mostly-Catholic dissident group comprised of the wives, daughters, mothers, and sisters of prisoners of conscience. The Ladies in White members joined a larger group of anti-communist dissidents in Havana following their weekly attendance at Mass. Service this Sunday is especially important to Catholics as they celebrate Palm Sunday, the beginning of Holy Week. HAVANA (CBSNewYork/AP) â€” President Barack Obama landed in Havana Sunday evening to kick off his historic trip to Cuba. Obamaâ€™s whirlwind trip is a crowning moment in his and Cuban President Raul Castroâ€™s ambitious effort to restore normal relations between their countries. While deep differences persist, the economic and political relationship has changed rapidly in the 15 months since the leaders vowed a new beginning. 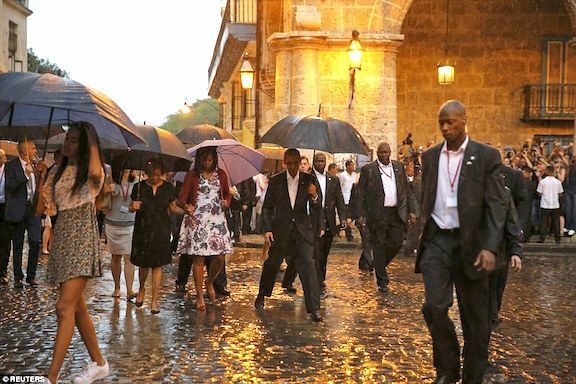 Wielding an umbrella on a rainy Havana afternoon, Obama and his family stepped off of Air Force One and were greeted by top Cuban officials â€” but not Raul Castro. The Cuban leader frequently greets major world figures upon their arrival at Jose Marti International Airport, but was absent on the tarmac. Instead, he planned to greet Obama on Monday at the Palace of the Revolution. 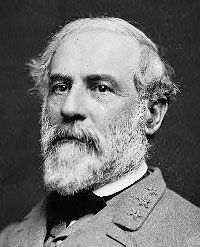 Jackson Holly, I also find this very interesting! Looks like Raul knows Obama is rightfully disrespected in America, and so he's not treating him like a star coming to Cuba! 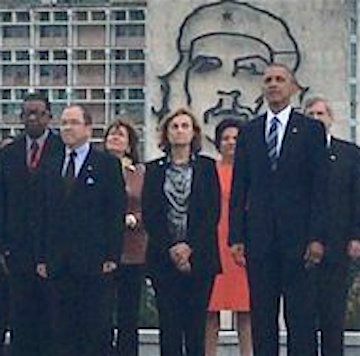 Yep, Obama is done when even a communist dictator won't revere him. You have to also love it that its raining there during their 3 days visit and they have to avoid puddles. lol Obama is done! As President Barack Obama boarded Air Force One for Cuba Sunday, crowds marched in Miamiâ€™s Little Havana against the presidential visit to the communist nation. 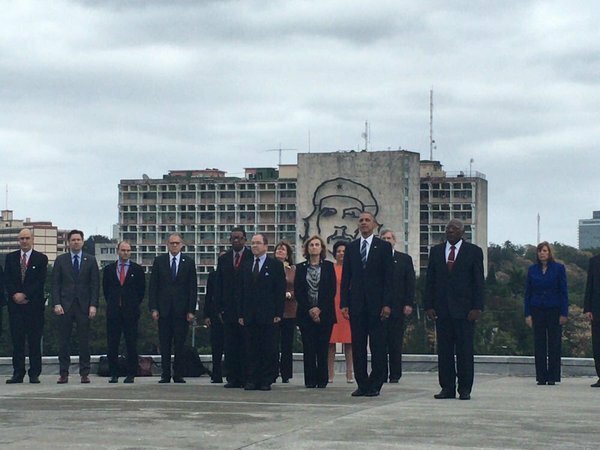 ... nice shot of Che Guevara & friends. The Pritzker family is an American family of entrepreneurs and philanthropists, and one of the wealthiest families in the United States of America, being near the top of Forbes magazineâ€™s â€œAmericaâ€™s Richest Familiesâ€� list since the magazine began listings in 1982. The family is most famous for owning the Hyatt hotel chain, and the Marmon Group, conglomerate of manufacturing and industrial service companies which has since been sold to Berkshire Hathaway. Other holdings have included the Superior Bank of Chicago, which notably collapsed in 2001, the TransUnion credit bureau and the Royal Caribbean cruise line. Penny Pritzker (born 1959), 38th United States Secretary of Commerce, chairman and CEO of PSP Capital Partners and Artemis Real Estate Partners, 2012 national co-chair of Obama for America, former Stanford University trustee. Jay Robert Pritzker, most commonly known as J.B. Pritzker, (born 1965), founder of Pritzker Group Venture Capital (formerly New World Ventures) and co-founder of Pritzker Group; national co-chairman of the Hillary Clinton presidential campaign, 2008. U.S. Secretary of Commerce Penny Pritzker traveled to Havana on October 6-7, 2015, becoming the second U.S. cabinet official to visit Cuba since the re-establishment of diplomatic relations on July 20, 2015. ... U.S. Secretary of Commerce Penny Pritzker helped lay the foundation for a new chapter of relations between the United States and Cuba after 50 years of broken commercial and diplomatic ties. On October 6-7, Secretary Pritzker became the second U.S. cabinet official to travel to Cuba since President Obama called for the re-establishment of diplomatic relations. 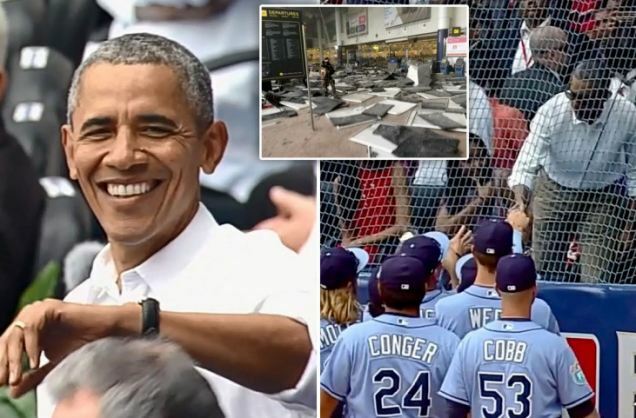 President Obama was all smiles this afternoon as he arrived at an exhibition baseball game between the Tampa Bay Rays and the Cuban national baseball team after he addressed the Belgian terror attacks at the top of his speech to the Cuban people this morning for less than one minute. He has ignored calls that he should return to the U.S. Obama entered the stadium with his wife Michelle Obama, daughters Sasha and Malia and Cuban dictator Raul Castro. The game kicked off with a moment of silence for the attack and a choir sang the national anthems of both countries. Then, it was time for the festivities. Cuban baseball players delivered individually-wrapped white roses to Mrs. Obama and her daughters before they took the field and attendees - including the U.S. president - went through several rounds of the wave.